Some times CNC parts may be less expensive than 3D Printed parts and are in the correct materials. 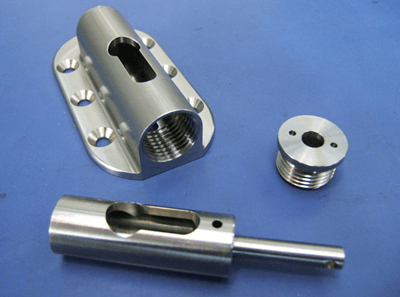 We provide CNC Metal and Plastic Components with the highest accuracy and competitive pricing. CNC machining parts can be used for both prototype and production. There can be tremendous value in prototyping your parts using the desired production material with CNC machining. As the market becomes more supportive of entrepreneurial efforts, more emerging small businesses will be more likely to reach a prototyping stage. Similarly, larger organizations will continue to push the envelope in the manufacturing of products. We pride ourselves in assisting both large and small businesses with not only the ability to produce single prototype, but also engineering support service to help with the development of their designs. By aiding in the final design when it’s in need, we can help clients to save time, and money by optimizing product specifications. UYEE provides a variety of CNC precision machining capabilities to fulfill the requirements of a diverse customer base. From automotive and aerospace to electronics, we have outstanding experience and provide excellent services. In addition, we offer EDM and laser cutting. Equipped with CNC turning centers and CNC Machining centers for both horizontal and vertical requirements, we are fully outfitted to meet the most demanding specifications with accuracy and cost effectiveness. When our clients come to us for a prototype, it is often accompanied by a strict time requirement due to the nature of prototyping itself. As a result, turnaround time is especially important in the prototyping stage. We can produce nearly any machined part prototype our client can design in a very short time frame. Reducing the prototype window even further is our ability to print a prototype of a design very fast. Our clients know that if mass production becomes feasible that they can trust us to deliver a product on time, on a budget, and with amazing quality. We have the capacity to handle any size run of CNC made parts for you. With expanded capacity, competitive pricing, quick delivery, and years of experience, the CNC machining center can take your project to the next level. With such a diverse line of services, from low volume runs to custom precision machine work, our qualified staff is able to coordinate your project quickly and efficiently. Our quality products, quick turn-around, and delivery times set the industry standard. We pride ourselves on producing Custom Machined Parts that go beyond what is expected and leave you more than satisfied. All members of our team are highly qualified, motivated and experienced professionals and we are on hand during every stage of production. A new project always begins with understanding the client’s needs. Looking at specific requirements, we are able to make recommendations and fine tune the design and manufacture of components. Our extensive experience combined with the latest technology gives our clients a comprehensive service. Aluminum is chemical resistant, easy to machine, and has a high strength to weight ratio – it weighs about one-third as much as steel. It is also a good conductor of electricity and heat, making it ideal for heat sinks, and reflects heat and light, is non-magnetic and is malleable. Aluminum is the third most abundant element in the earth’s crust after oxygen and silicon and is a comparatively new industrial metal, widely used for less than 100 years, and applied for many fields. If you need aluminum parts machined we are one of the most capable and affordable sources, and we can get the job done right. By offering a variety of Machined Aluminum parts, we can respond quickly to your needs. Our experienced estimating team knows the right questions to ask, so we are sure to give you what you need, without building in cost for things you don’t need. We have manufactured aluminum-machined components for the electronics, aerospace, electrical, and energy generation industries, to name a few. Aluminum machining is one of our specialties – use the expertise of UYEE team for all your aluminum machined parts requirements! The Precision Metal Parts are manufactured by combining technologies, and matching the technologies to the requirements of the final product. The R&D, production, and QA departments are all at the customer’s service, and provide standard as well as advanced engineering solutions.